The Cadillac CTS-V has been one of the leading luxury-sport sedans sold in the United States for several generations now, but the newest iteration – packing the new LT4 from the Camaro ZL1 and the Corvette Z06 – makes this V the most powerful yet. With 640 horsepower, there aren’t many sedans in the world that will keep up with this roomy Cadillac, but there are some. For those CTS-V owners who want to drastically cut down on the number of cars on the street that can beat them in a sprint from a stop light – Hennessey has the answer. The HPE1000 package from Hennessey Performance for the current generation Cadillac CTS-V has an official output of 1,000 horsepower and 966 lb-ft of torque at the rear wheels. With the help of a lightning-quick 8-speed automatic transmission, this sleek sedan dashes from a stop to 60 miles per hour in just 2.9-seconds while running the quarter mile in just 10.5 seconds at 135 miles per hour. I am going to guess that those times included a stickier-than-stock tire, as even with 1,000 horsepower – getting from 0-60 in less than 3 seconds with a common street tire and rear wheel drive is an incredible feat. All of this power is achieved by adding a larger supercharger, a custom intake manifold, a custom camshaft, ported cylinder heads with stronger valve train components, a high flow intercooler system, long-tube stainless steel headers, stainless steel midpipes with high flow catalytic convertors and a custom dyno tune with Shell 93-octane pump gas. That leads to an output of 804 horsepower and 777 lb-ft of torque at the rear wheels – representing a massive increase over the stock figures of 548 horsepower and 511 lb-ft of torque that are also shown on the Hennessey website. 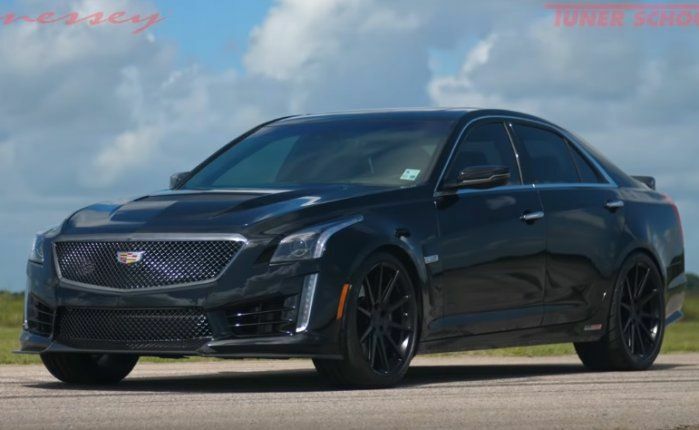 In the video below, Hennessey shows off the HPE1000 package for the 2016-2018 Cadillac CTS-V, including a clip of a dyno run (no numbers in this case) followed by footage of the car blasting down the test track at very high speeds. We don’t get to see a quarter mile run or any timed footage, but this is probably the best video you will find of the HPE1000 CTS-V in action, so crank up your speakers and enjoy! The 1000hp rating is supposed to be at the flywheel and the dyno reads at the rear wheels. Still a hell of a loss (21%) from flywheel to rear wheels though. Agreed. I saw the dyno chart and was like..wait a minute...this is a RWD car, not AWD. I know most AWD have a 12-15% loss; so 21%? I call shenanigans. I haven't heard a lot of good feedback about the Hennessy modded cars. Yeah, Hennessy has a mixed reputation, especially for out of state purchases. But they do consistently come up with new, high HP cars to please the press and make headlines. I have to wonder how well the super-CTS-V is going to put down such immense power on street tires, or even drag radials. It would be interesting to see this beast against the Hellcat Charger on the street. The Hennessy CTS-V certainly has it out-muscled, and the regular CTS-V is an impressive luxury/performance car, but this is a pretty BIG price difference for the CTS-V upgrade, so I would like to see if it's worth it overall in terms of real world usability.